This aerial picture taken on September 7, 2009 shows the artificial island known as Hulhumale, built near Male, capital of the Indian Ocean atoll nation of the Maldives. The Maldives faces the threat of extinction from rising sea levels, but the government said on Thursday it was looking to the future with plans to build homes and a golf course that float. The Maldives faces the threat of extinction from rising sea levels, but the government said on Thursday it was looking to the future with plans to build homes and a golf course that float. An increase in sea levels of just 18 to 59 centimeters would make the Maldives -- a nation of tiny coral islands in the Indian Ocean -- virtually uninhabitable by 2100, the UN& #39;s climate change panel has warned. President Mohamed Nasheed has vowed a fight for survival, and last month he signed a deal with a Dutch company to study proposals for a floating structure that could support a convention centre, homes and an 18-hole golf course. "It is still early stages and we are awaiting a report on the feasibility," a government official who declined to be named said. The company, Dutch Docklands, is currently building floating developments in the Netherlands and Dubai. There was no immediate comment from the firm but its website said it undertook projects that make "land from water by providing large-scale floating constructions to create similar conditions as on land". 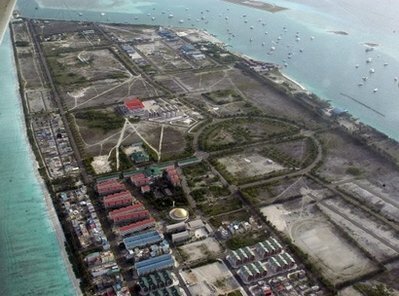 The Maldives began work on an artificial island known as the Hulhumale near the crowded capital island of Male in 1997 and more than 30,000 people have been settled there to ease congestion. The city, which has a population of 100,000, is already protected from rising sea levels by a 30-million-dollar sea wall, and the government is considering increasingly imaginative ways to combat climate change. Nasheed, who staged the world& #39;s first underwater cabinet meeting in October to highlight his people& #39;s plight, has even spoken of buying land elsewhere in the world to enable Maldivians to relocate if their homes are submerged. He has also pledged to turn his nation into a model for the rest of the world by becoming "carbon neutral" by 2020. His plan involves ending fossil fuel use and powering all vehicles and buildings from "green" sources such as burning coconut husks.